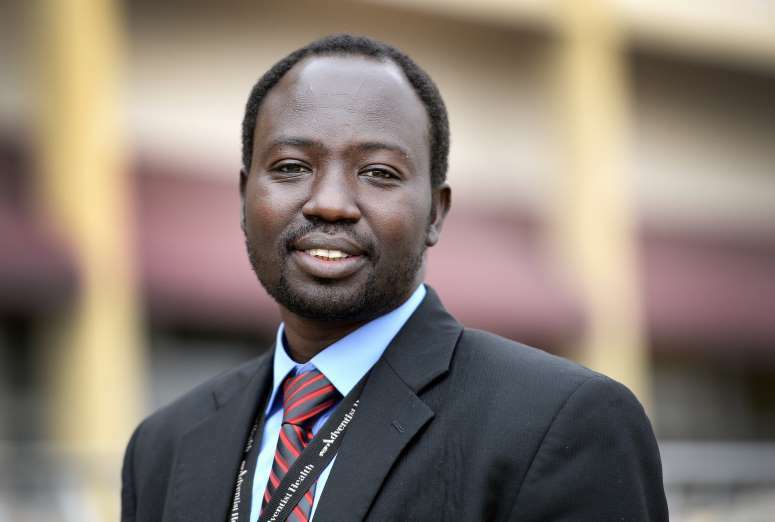 Sometimes when refugees are at their lowest emotional point in his office in Hanford, Jacob Awar Ayuen, a psychiatric physician assistant, will tell the patients his own story of being a lost boy, walking thousands of miles to escape a bloody civil war. He was about 8 years old in 1987 when the civil war in Sudan drove him and an estimated 20,000 other boys mostly ages 8 to 12 to walk 1,000 miles from their villages to safety, first to Ethiopia, and eventually to a refugee camp in Kenya. He and the others who survived the unforgiving journey came to be called “The Lost Boys of Sudan” for their likeness to the orphaned boys in Peter Pan. In 2001, the United States accepted 4,000 of those refugees who came to begin new lives in a country at peace. Ayuen was one of them. But armed conflict seemed to follow him. His arrival in America was delayed by the 9/11 terror attacks. And fighting in South Sudan is never far from his mind. Ayuen has family still there. South Sudan continues to uproot people. Kakuma, the Kenyan refugee camp that Ayuen left in 2001, is full once again of children and families. The 20-year-old civil war in Sudan ended in 2005, but peace didn’t last long. After South Sudan gained independence in 2011, a civil war erupted in 2013. A 2015 peace agreement dissolved in 2016 and fighting, mostly along ethnic lines, has continued. “People are still suffering, still dying,” Ayuen says. He has brought children out of war-torn South Sudan to Kenya to go to school. It’s a way he can make life better for people who remain in the country that he fled as a Lost Boy three decades ago. Ayuen was herding cattle outside his village when the warning came. It was not safe to stay. Young boys in southern Sudan often lived in cattle camps away from their families, and Ayuen was at such a camp in 1987 when war erupted. There was no time, and it was too dangerous, to go home to his mother. He followed older men who led the young herders out of the camp. Barefoot, barely clothed, Ayuen walked until his feet bled. And walked some more. “You step on something sharp and you just keep moving. You can’t dig it out. After awhile, you get used to it.” There were nights without sleep and days filled with fear when wild animals chased him. After three months and 1,000 miles from the cattle camp he had fled, Ayuen and the other boys crossed the border to Ethiopia. No one greeted them. There were no buildings. No homes. No running water. The boys divided into groups of about a dozen. Ayuen helped build houses, chopping trees and cutting grass with machetes for thatched roofs. By 1991, the Ethiopian camp had become a refugee haven. The United Nations had built a school and Ayuen was in third grade. But normalcy did not last. Ethiopia was at war and the inhabitants of the camp were in danger. Four years after he had fled Sudan, he had to go back through the strife-ridden country to reach the border with Kenya. It was the same unforgiving trip. They walked farther to another town, and a rescue convoy came three weeks later. Ayuen hopped into the back of a cattle truck packed with refugees going to Kakuma. On Sept. 11, 2001, he was on a plane to the United States. An hour before the plane was to land in New York, two airline jets crashed into the World Trade Center’s twin towers. “None of us could believe that America could be attacked by planes,” Ayuen says. Passengers were scared, anxious and worried, but he remained calm as the pilot diverted the plane to Newfoundland, Canada. “This was not the worst experience for us.” In the United States, Ayuen would be settled in Vermont. He lived with a host family for two weeks before moving into an apartment with five other Lost Boys. They cooked together, played soccer and dominoes, attended church. And they got jobs – Ayuen at a soap factory. But he had a plan when he came to the United States, and it did not involve quitting: He would become a citizen, go to college and have a career. Ayuen came to Adventist Health Community Care in Hanford in 2014 as a psychiatric physician assistant after graduating from Union College, a Seventh-day Adventist college in Lincoln, Nebraska. Ayuen had attended college on a National Health Service Corps scholarship that required service after graduation in an underserved area. Hanford met that requirement, and Ayuen says Adventist Health aligned with his values and personal beliefs. Ayuen had an incentive to build a career when he came to the United States. Before leaving Kakuma Refugee Camp, he had proposed to Alakiir Deng, another refugee. He needed money for a bride’s price – a dowry – to marry and to bring Deng to the United States. Deng, 35, had experienced her own harrowing escape from her village in southern Sudan in 1988. She was only 3 years old but had to walk the 1,000 miles to the refugee camp in Ethiopia. Her mother carried a younger brother. And on the journey four years later from the Ethiopian camp to Kenya, Deng says her stepmother was shot in her left foot before the family reached the Kenyan border. “We just tie the foot not to bleed out and we move on.” Deng met Ayuen at the elementary school at the Kakuma Refugee Camp. They wed in Kenya in 2004. After the wedding, Ayuen returned to the United States to continue his education and to save money to bring Deng, who was pregnant with twin boys, to the United States. Ayuen briefly returned to Kenya to visit his wife and sons Biar and Mach in 2007; twin daughters, Nyang and Apajok, would be born in 2008. 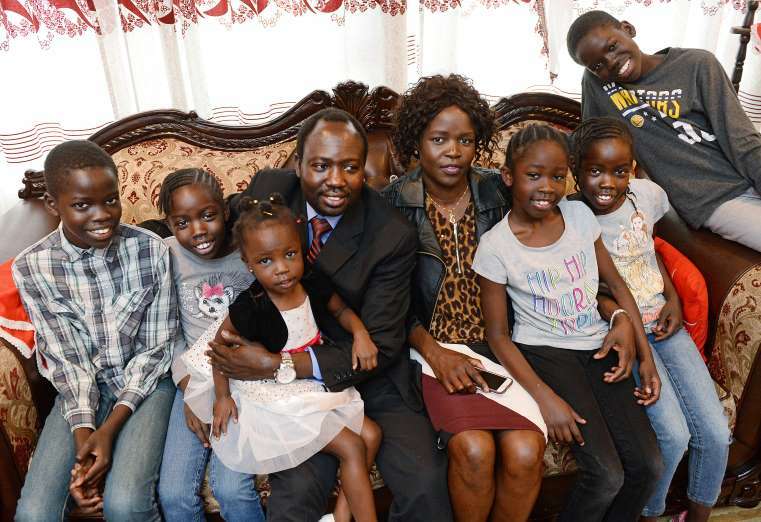 Deng and the children joined Ayuen in 2008 in Omaha, Neb. Deng is now studying to be a licensed vocational nurse, taking classes in Fresno. She and Ayuen, the two sets of twins and younger daughters, Ayak, 7, and Abeny, 3, live in a two-story home in a gated community in Hanford. They have made friends with neighbors, attending children’s birthday parties. But they miss South Sudan – weddings, dances and cultural interactions. And Deng and Ayuen worry about family and friends who remain in South Sudan. Among them are Deng’s mother, father, and a brother. Ayuen has a brother and sister in Kenya. His father died in 2011, and his mother, four sisters, and a brother are in Kenya. A salary as a nurse also would help with the family’s finances – to save money for college educations for the children, help relatives in South Sudan and Kenya – and maybe for a vacation. Besides working at Adventist Health, Ayuen works weekends at Kaweah Delta Medical Center. Ayuen also wants to keep helping children in South Sudan. He has brought a dozen children to a school in Kenya, who arrived this month. “I’m the primary support for food and school,” he says. It costs $25 a month for tuition for one child. Education made his life better, he says, and he wants others to have the same opportunity.